What at home may be no more than a simple exchange of pleasantries is in Tanzania a catalyst for discussion, consultation, ventilation, or communion on any number of subjects. There were many times when I felt like I was being “grilled,” even intruded upon. This happened in initial conversations with new people, but ultimately I found them to be genuinely curious about my family, lifestyle, and ambitions. A recurring theme was why I had chosen their home as a destination. Why Tanzania? The first few times I pieced together an answer to this question, I found myself surprised by how carefully my listener held on to my words. Often following up for clarification. Know that your response will be considered seriously. It’s best to speculate your motives ahead of time, practice your sincerity, and don’t be afraid to commiserate with acquaintances. It is an understatement to call the Tanzanian greeting process extensive. It often includes belly laughs, pats on the back, the aforementioned game of 20-questions, introductions to family members, and even thumb wars. Yes, thumb wars! If you want to have an eye-to-eye exchange, it is essential to recognize that initiating dialogue depends on your relationship with your addressee. All elders and figures of authority are to be greeted with “Shikamoo,” which has archaic roots in Arabic referencing seven kisses to the feet. It is expected that you will speak first. Say it with a drawn out sh- almost under your breath: “Sssshhhhkamo”; that’s how I’ve heard it, at least. When greeting a single person your age or younger, use “Hujambo,” (are you well? ), and with a group, “Hamjambo.” Your ability to use the right greeting at the right time, instead of the phrase tourists typically use, “Jambo,” will earn you distinction from the perfunctory passersby. Literally. Given the country’s proximity to the equator, time is measured relative to sunrise and sunset, which are essentially consistent year round. Bye-bye, 4 PM dinner cravings in December! Think of 6 o’clock as your noon/midnight—AMs and PM are not necessary. 7 o’clock is Saa moja (one o’clock), 8 o’clock is Saa mbili (two o’clock), and so on. So don’t be confused when someone invites you to the morning market at 4. Most Tanzanians I know are optimistic, family-oriented, and instinctively present. Pole pole, “slowly, slowly” in Swahili, is more than a catchphrase; it is a way of life. For an American, or another member of Western culture, it is very easy to feel frustrated with the passing of time in East Africa. You may find, like I did, that a 1 PM meeting will turn into a 4 PM meeting without a word or song and dance. Don’t forget that you are a guest to this country. You’re not its meter maid. Learn to act poa kichizi kama ndizi (crazy cool like a banana). In the US we have a stigma associated with asking others for help. Our societal values of self-sufficiency and individualism create a culture of shame for those rely on the generosity of others to achieve their goals. Conversely, Tanzanians on average associate much less shame than Americans do with soliciting the assistance of others. You may find requests from acquaintances and new friends unabashed, opportunistic, and even offensive. Keep in mind that the reason why Americans tend to see this as rude is because of our different cultural standards. Don’t take it personally or let your offense deter your generous heart. Please also be careful with your words. It’s very easy to make promises that can’t be kept, especially later on, once the reality of life back home settles in. Be cautious and selective when sharing your personal contact information. Prepare yourself for a quick and direct response for unanticipated solicitations. As Tanzanians are less likely to refrain from requesting, they are also are less likely to take offense if such a solicitation is rejected. As long as you’re polite and clear, and don’t set expectations you cannot or will not meet, you won’t be losing any friends. This was my greatest struggle in Tanzania: not the 16 noun classes of the Swahili language, nor the etiquette differences, nor the challenge of fostering the skill of patience. I was frustrated by how people perceived me in Tanzania. Even after months of living with a family in a small community, I felt that my appearance tied me to a class of visitors I could never escape. Mzungu means “person of European descent” in Swahili. It can be meant affectionately, but the nature of its racial classification paired with its usage patterns conduce a derogatory impression. Until my last day in Tanzania, I was still addressed as mzungu by strangers and by children who came running from the hills, calling this word as if it were my name. It was not hard for me to fall in love with Tanzania. It was a challenge to make friends, get my greetings straight, and learn to appreciate a bucket shower. But it was supremely difficult to get over my ego and focus on my close relationships rather than strangers’ judgments. My advice on this topic is to make yourself open to others so that they may open up to you. Embrace the reciprocity of sharing and its power for bridging connections. If you dive in to Tanzania with an open heart, you will become a wonderful rafiki (friend) to many! 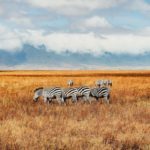 Have you traveled to Tanzania? What were you impressions? Email us at editor@pinkpangea.com for information about sharing your experience with the Pink Pangea community. We can’t wait to hear from you. Alison Sever had led service programs for youth in Peru and Costa Rica and outdoor programs for peers in the Green Mountains of Vermont. A native of Boston, Massachusetts, she has taught in Tanzania, hitchhiked up the coast of Uruguay, trekked in Chilean Patagonia, and wandered the wintry streets of Prague with a camera. Next on her bucket list are Brazil, Colombia, and a culinary tour from Eastern Europe to Turkey. When she’s not planning her next adventure, she’s battling her family members at Rummikub, practicing yoga, or bumming around the rock gym. Alison is the Admissions Coordinator for Global Routes. Well done Alison… Great writing. It is people like you that I am so proud when you visit other countries because you learn, you appreciate others cultures, you respect and your geniune about what you do, the passion for volunteering. Very refreshing reading your piece.